I didn’t know much about Lyndon B. Johnson, I was young child during his Presidency. He was in office from 1963 through 1969. Living in Texas, especially in Austin, you hear a lot about his legacy. My visit out to the LBJ State Park was educational. 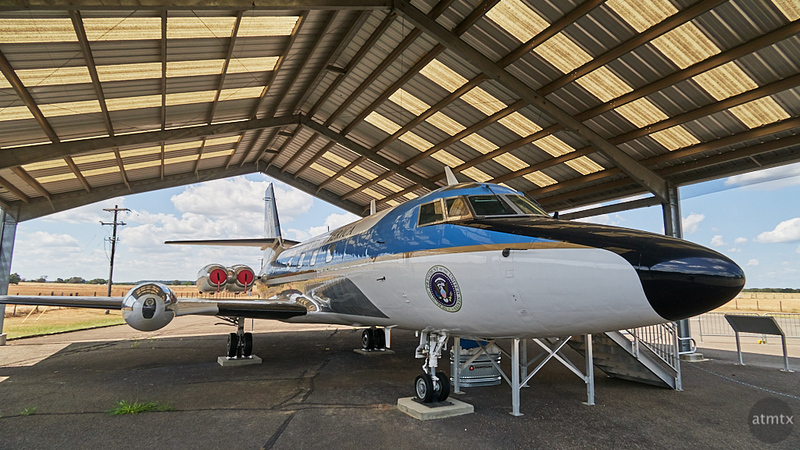 One of the more interesting artifacts at the Texas ranch turned state park, is the presidential plane. Johnson spent a lot of time in Texas and his ranch house became known as the Texas Whitehouse. An airstrip was constructed on the property, however, the large Boeing 707 serving as Air Force One, was too large to land. President Johnson flew Air Force One from Washington D.C. to San Antonio, where he boarded this small plane for his ranch. My Cinematics works especially well here, I think, with its wide-angle sweep. I brought my Olympus PEN-F with me, but used very little of it during this trip. Instead, the Canon G7X Mark II got the bulk of the use. The small camera seemed to work well for tourist snapshots.